Although I've been using Kate Somerville's miracle acne-clearing EradiKate for years, I've recently sampled more of her refined, clinical skincare line and I got addicted. These days, I'm all about minimal effort in my beauty regimen, which means less fuss and no gimmicks in my products, which is why I'm loving Kate Somerville skincare. Kate's unique approach to her self-named line introduces the power of medicine into her effective formulas. Created in tandem with her famed Skin Health Experts Clinic treatments, her products are made to achieve the same results whether you're on-the-go or you can't step into the clinic itself. I've tried plenty of her products and I've never been more satisfied with an entire collection. 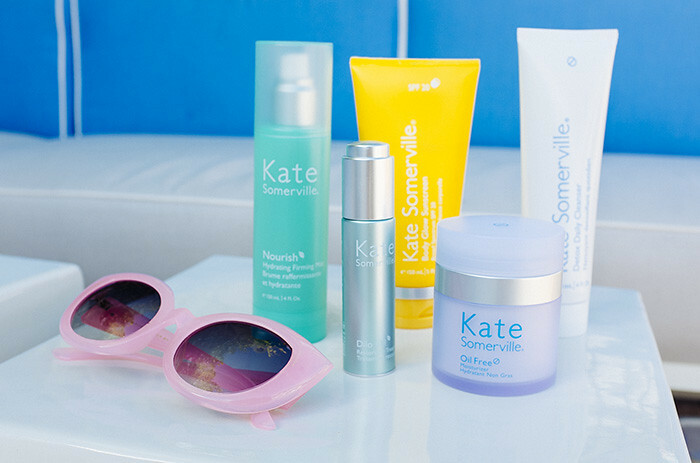 It's rare for one to be loyal to one brand of skincare, but Kate Somerville makes it easy. 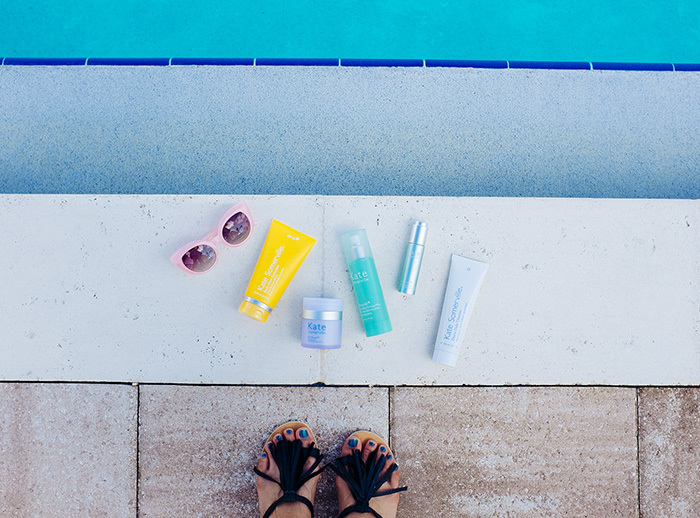 As I'm traveling a lot this upcoming summer, I turned to Kate Somerville to take care of my skin on-the-go and I've put together my favorite summer essentials that makes checking in your bag at the airport worth it. 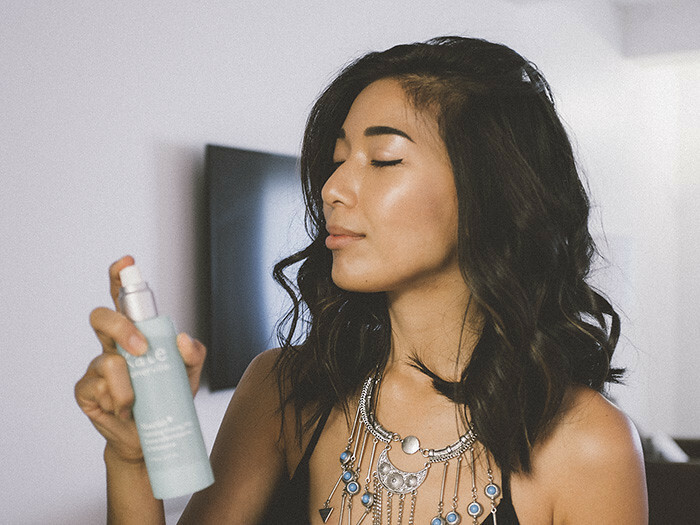 My day won't start right until I clean my face with Kate Somerville's Daily Detox Cleanser. This gel is formulated for acne-prone skin and its smooth application with my Clarisonic works wonders in washing my skin beautifully clean. Next I'll spray a layer of Nourish Mist to act as a toner and refresher when my pores are open after cleansing. Then I'll apply a couple drops of Dilo Oil. I love it so much for its fragrance and light moisturization. Don't be afraid of oils even if you have oily skin! It's meant to naturally nourish your skin and stop the over-production of oil which tends to happen in my t-zone. I'll finish off with massaging the Oil-Free Moisturizer into my face and then another spritz of Nourish Mist (I can't get enough of this). As a final last step, I never the leave the house without sunscreen, so I apply the Body Glow Sunscreen all over my arms, legs, and any other exposed areas. This one is so fun because the sunscreen also has a hint of shimmer, which really makes your skin glow in the sunlight. So these are my summer essentials that work in improving my skin's health and I'm really excited for one of you guys to try these for yourself! 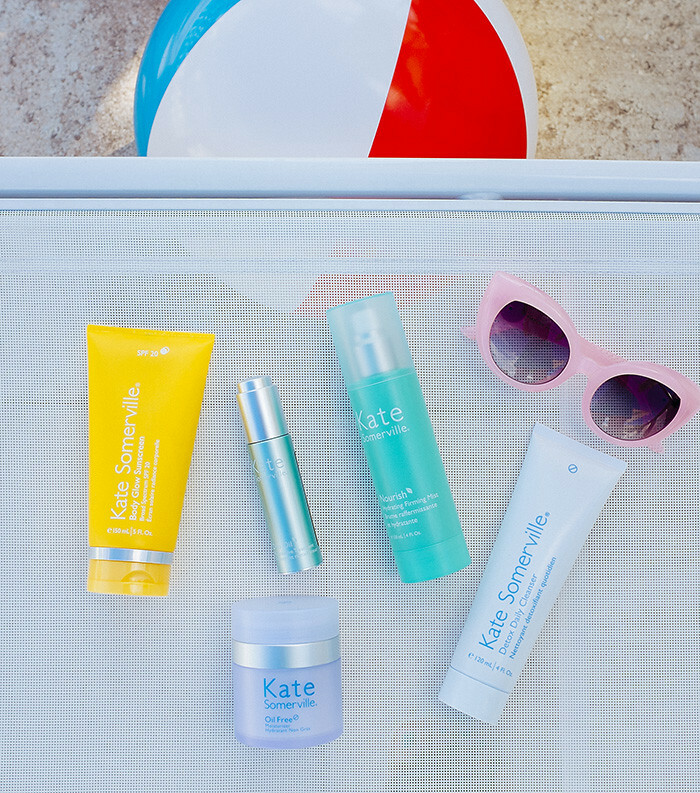 I partnered with Kate Somerville to give away a full set of summer essentials that includes all of the products mentioned above: Daily Detox Cleanser, Dilo Oil, Oil-Free Moisturizer, Nourish Mist, and Body Glow Sunscreen. All you have to do is enter the giveaway on my Instagram here. The winner will be chosen on June 3rd. Good luck everyone and thank you for entering! What a great swimsuit and shades. This photo is amazing! It's so creative! You somehow managed to make skin care products look like famous artwork! There is also great content in the article!! I would love to try the daily detox cleanser! I've been looking for a good cleanser! Thanks for the chance! Oh and I totally love that bathing suit top! !